Angie Thomas‘ powerhouse book The Hate U Give took the publishing world by storm. It was published in February of 2017 and has sat on the New York Times Best Sellers List ever since. Thomas captures the intensity of terror involved in situations of police brutality, the daily struggles involved with trying to rise above the situation that you were born in to and common teen issues like dating, friendships, and family dynamics. The book balances the stakes of the experiences so that although the reader is disappointed when Starr, the central character of the story is hurt by her friends we know that what she experienced when witnessing the murder of her best friend Kahlil was much more intense. Starr at her private school. Director George Tillman Jr. directs the film version of The Hate U Give with his foot on the emotional tugging pedal at max capacity during every scene. Starr is as equally traumatized talking to her dad about dating a white boy than she is overhearing white kids at school using a march in Kahlil’s memory as an excuse to get out of class. The emotional stakes are amped up so high throughout the film that in the final moments when the audience should be cheering and shocked by the scene, we are instead left exhausted and drained from our previous emotional investments to react as intensely as the scene deserves. The film score is hyper-emotion inducing to a fault. The story would have been served inducing emotions with its own power. 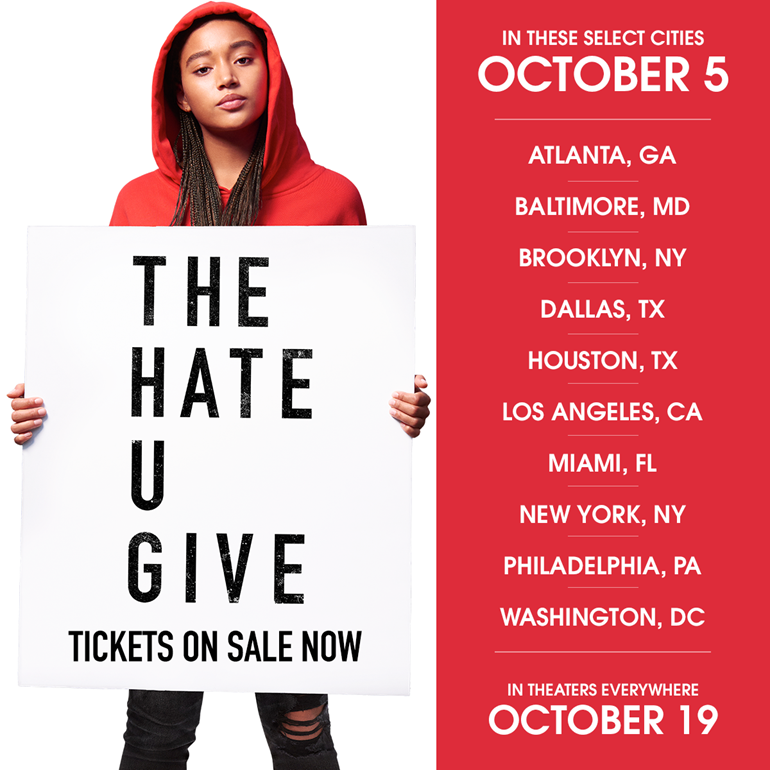 Starr Carter (Amanda Stenberg) is a 16-year-old girl who splits her life between time in her neighborhood, the ghetto called Garden Heights. Her father doesn’t want to move from there even though he has past affiliations with a dangerous gang that they can never escape. Because she wants a better life for her kids, Starr’s mother sends her and her brother Seven to a private, predominately white school called Williamson Prep. Starr behaves and speaks completely different in these two very different quadrants of her life. She has a white boyfriend at school who she refuses to allow to see her home or neighborhood. She never feels like she is completely being herself because she is holding part of herself back wherever she is. At a weekend party, Starr runs into her childhood best friend and love interest Kahlil. He has been forced a rough hand by life. His mother is a crack head, his dad isn’t in the picture and his grandma is dying of cancer. He has trouble finding work and even if he could it wouldn’t be enough to pay for all of the family expenses. He begins selling drugs to support his family. Shots are fired at the party and Starr and Kahlil flee together in his car. They are pulled over by the police for no discernible reason and Kahlil is harassed by the cop. He reaches into the car to grab his hairbrush and is shot three times. The press learns that he was a drug dealer and he is represented in the media as a thug. Communities divide because Kahlil’s life is discounted by society. They don’t consider the circumstances of his reality. Meanwhile, Starr, the only witness is being ostracized by people on both sides of her life. She didn’t want anyone to know that she was the witness for fear it would affect her family and friends. The gang leader of the Kings learns that she is the witness and a physical threat is added to the pressures her family already has. The story is phenomenal. The performances are also quite good. Amanda Stenberg has a lovely balance of strength, timidity, and charm to be a very engaging central character. Her family, mother Kenya (Dominque Fishback), brother Seven (Lamar Johnson), little brother Sekani (TJ Wright) and Dad (Russell Hornsby) have a palatable bond that is the base for many of the most poignant moments in the film. Khalil (Algee Smith) burns with charisma in his pivotal role. If the audience doesn’t feel for Kahlil than the entire story would topple. Anthony Mackie is a real stand-out as King. The intensity of his performance is unforgettable. The film is worth seeing for those who don’t already know all of the nuances of the story. The final quarter of the film is the strongest segment. Here’s hoping that with the release of this film eyes, ears and hearts will be open to thinking and discussions about the real problem that we have in this country with equality and justice for all. Next Houston Cinema Arts Fest 2018 Announces Line-Up, Most Tickets $10!